The other night my mom and I decided to have a much-needed girls’ night and, having heard good things about The Salty Pig near Back Bay Station, we decided to give it a go. Although it is technically one of what I think is way too many pig-parts-are-now-cool charcuterie and booze places, with a very generic pig-parts-are-now-cool charcuterie and booze place name (in Hong Kong, I went to an almost identical one called “The Salted Pig”), I enjoyed the vibe at TSP and thought it unique among the others, at least those here in Boston. The dining room is informal and laid back, yet glossy and chic, with neat high-top chairs and comfy booths from which to watch the action across the bar – pizza dough being flipped and shoved into the oven (gas-fired, but whatever…), cured meats, chili peppers and garlic cloves swinging from the kitchen ceiling, a bartender mixing up some of their signature cordial cocktails (more on this later) and delicious entrees flying out of the semi-open kitchen. The staff seems very friendly and sometimes slightly awkward in a cute, quirky and humble way. All in all it’s a great place to grab a bite with someone you love and catch up on how your lives have been going lately. 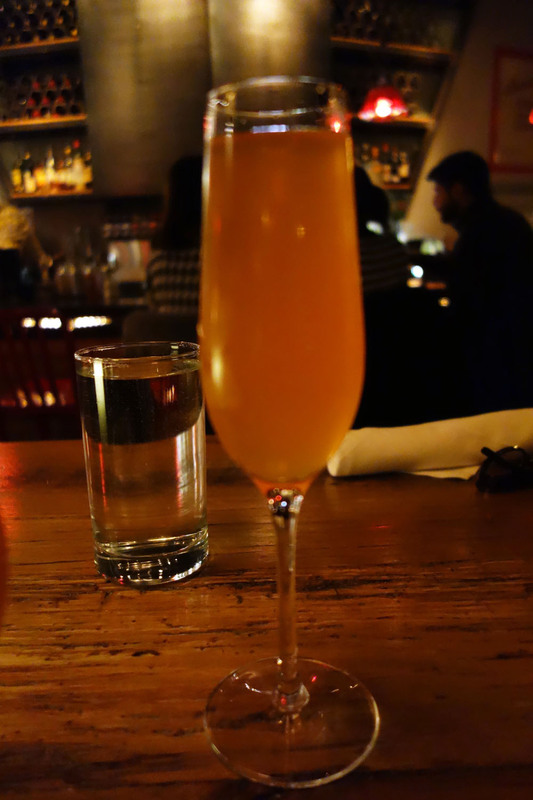 We got The Hybrid, which was made of Pamplemousse (grapefruit liqueur), Aperol, orange juice and topped off with sparkling wine. It was light and fruity, with the grapefruit liqueur toning down the sweetness of the orange, while the Aperol brought a beautifully bitter finish to the sip. The sparkling wine lifted the cocktail up and made it refreshing and light, despite this bitter finish. We also got The Orchard, which was made with Downeast cider (a yummy crisp thing with no preservatives added), Creole Shrubb (a slightly bitter rum-based orange liqueur) and bitters. It was sweet but not over-the-top, as many poorly made cider-based drinks tend to be. 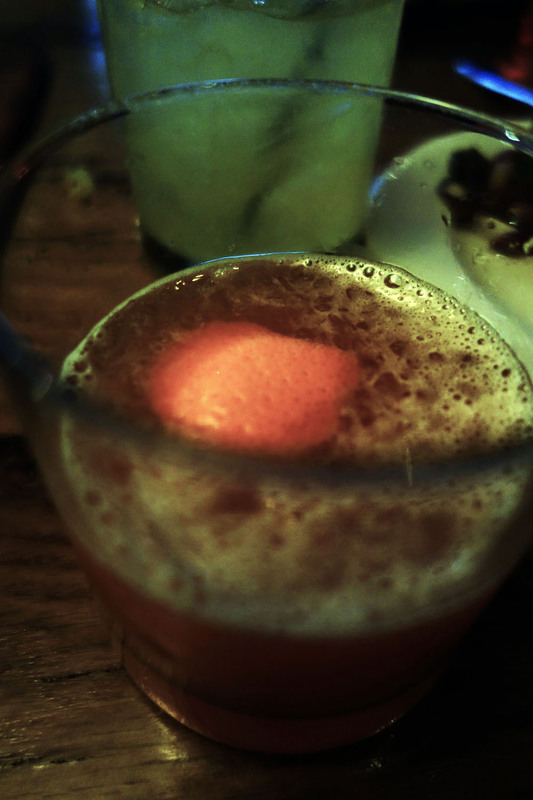 It had a nice acidity from the dry cider and a spicy, peppery quality from the orange liqueur. Perfect to eat before the meal to get set the hunger pangs going. 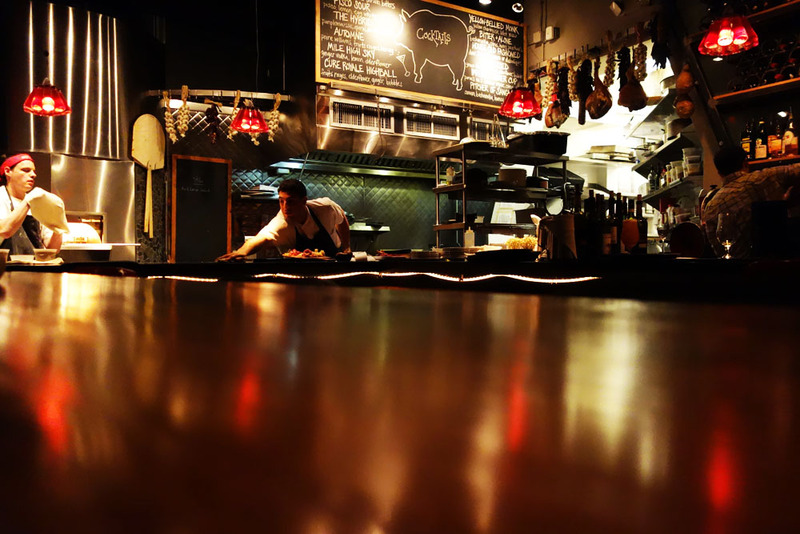 The menu at TSP is divided into the major sections, which basically represents the two different types of dining at the restaurant. 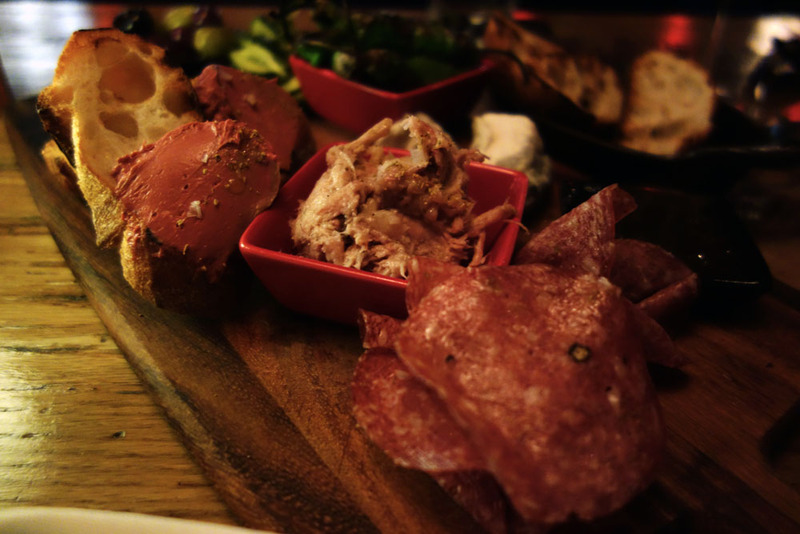 One can go with the snacking option and select meats, cheeses and accompaniments and build one’s own charcuterie and cheese board to pick at while enjoying a cocktail or two. One can also choose a more heartier dinner entree and either share a rustic, farmhouse-style pizza (their list includes one called The Salty Pig, which features daily “pig parts,” mustard and pale ale vinaigrette and looks particularly delicious) or choose one of their meaty pastas or tavern-style seafood options (mussels with bacon and shallots, grilled calamari, etc.). As my mom and I are dainty little things with bird-like eating habits, we decided to get a board of little numnums. We listed off our selections to the waitress who memorized it without scribbling anything on a dupe, and she managed to get us almost exactly what we ordered, with some changes that we actually did not mind at all. 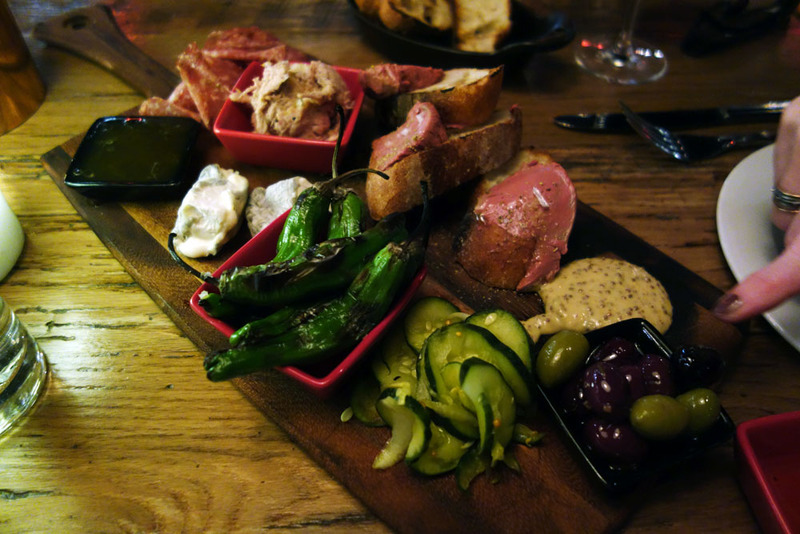 From the meats, we chose the Chicken Liver Mousse, made in the Salty Pig kitchen. It was incredibly smooth, buttery and cool, melting onto the roof of my mouth instantaneously and coating my tongue with its metallic, innard-y sweetness. It was sprinkled with fennel pollen, which added a nice herbal zing and some coarse sea salt, which brought the natural sweetness of the mousse to the forefront. Spread over crunchy toast points, it was a great bite. 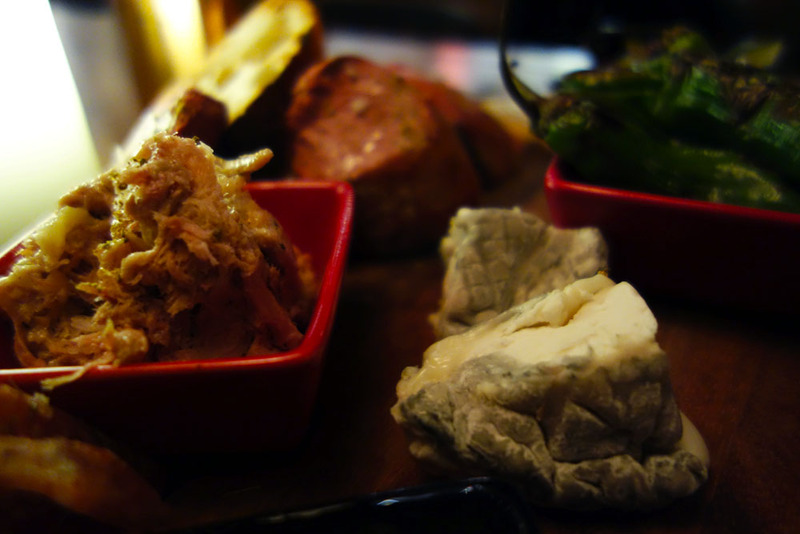 We also ordered the Pork Rillette, also from the Salty Pig kitchen, made from shoulder and belly. It was smooth, with tender shreds of meat held together by the wonderful fat it was cooked in, and formed into a spread-able paste. It was flavored with coriander, fennel and orange, which took away from the extreme saltiness of the pork and brought the rillette into a more neutral salty-sweet realm. Next, we had some Finocchiona, a dry-cured pork-based sausage, flavored with garlic and fennel. This went particularly well with the house-made foccaccia-type, slightly sweet bread that our waitress brought out before the meal along with some mature olive oil of good quality. The whole-grain, spicy mostarda, which we actually did not order but which was very much appreciated, went well with the finocchiona and added a face-unclogging heat to the board. From the extremely well put together “Stinky Cheeses” list, we selected the aptly named Bonne Bouche Goat Cheese, from Vermont Butter & Cheese Creamery. It was actually not on the menu on the night we went, but was recommended as an alternative to the Valençay-style ash-coated goat cheese Bonaparte, which is usually featured on their menu. Ash-coated cheeses are great because the thin layer of dark, pulverized ash in the rind stands out strikingly against the milky white interior of the cheese, giving it the aesthetic appeal and the artisanal feel that is a key aspect of stinky cheeses. The ash also protects the soft cheese from forming a thicker, coarser rind that would otherwise crust over the soft cheese inside and overpower it with its mold. The cheese stayed perfectly creamy, almost completely liquid on the inside and gradually firmer towards the exterior. The flavor was nutty (as is characteristic of goat cheeses), piquant and slightly citric. The acidity, however, was balanced out by the ash rind. The cheese was perfect spread over toast points and drizzled with a bit of the Smoked Shallot Marmalade, which had a smokey, grilled flavor that reminded me of smoked eggplant. The marmalade was gooey and moist, with shreds of tender sauteed shallot, the sweetness of which went very well with the pungent cheese. The unexpected stars of the board were the Charred Shishito Peppers, which I highly recommend ordering as a complement to any of the meats and cheeses. The peppers were very thin-walled and thus charred very nicely, becoming tender but still maintaining a bite. The flavor was mild and vegetal, mixed with some smokiness from the char and sweetness from the caramelization of the exterior. There was a very mild heat at the end of each bite, though, which made them practically addictive. The peppers were warm and went well with some of the cool elements of the dish. Also thrown on the board were some thin ribbons of cucumber, lightly pickled in sugar and vinegar, and some green, as well as kalamata olives for an extra bit of acidity and freshness. 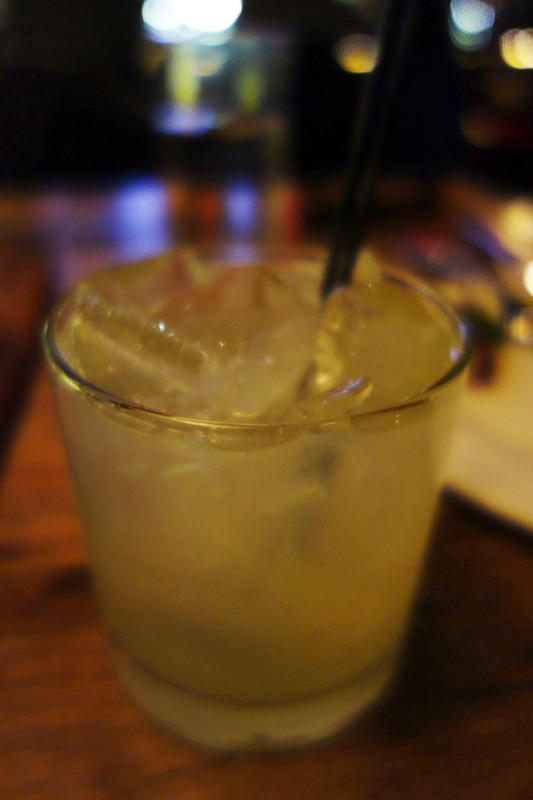 To follow up on drinks, we tried the Yellow Bellied Monk, which was made with Yellow Chartreuse, Lillet, and yuzu. Although I really liked the name of the drink, I didn’t really care for it because it was a bit too mild in flavor for me. The Yellow Chartreuse was very subtle, almost vegetal tasting and the yuzu added only a very subtle acidic note, which didn’t really stand up to the greenness of the former. The Lillet didn’t pack as powerful a punch as I was expecting and while volume-wise it was the base of the drink, it didn’t add too much flavor. And lastly, the Bitter & Alone. Fernet, Jaeger, Unicum, Limet, Becherovka – these are some of my favorite things. As my life practically revolves around food, a bitter digestif at the end of a meal is something I appreciate very much as an aid to breaking down the food in my belly. This last drink was Becherovka-based, diluted with some fresh fruit juice whose fibrous pulp made the drink nice and thick, sweetened with floral honey and spiced up just a bit with Peychaud’s bitters, which has a mild floral flavor that went very well with the herbal zanggg of the Becherovka. An orange rind thrown in for some extra citric aroma. 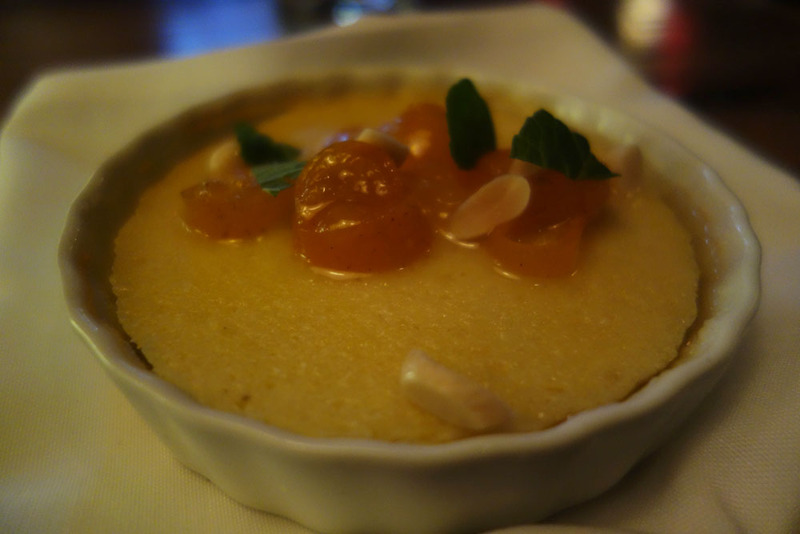 And for dessert, a Clafoutis, made with ricotta cheese and topped with kumquat marmalade and Marcona almonds. I’m not really sure why they called this a clafoutis, since the latter is actually a French dessert with a flan-like batter which always has cherries baked in. It isn’t even technically a flaugnarde, because the batter is not smooth and eggy. But whatever this was (more like a revamped cheesecake), it was delicious. The ricotta batter was coarse on the tongue but altogether pretty smooth and melty, warm and comforting. It was flavored, I think, with honey or french vanilla, because it had a nice clean, floral element in its flavor. It was topped with a kumquat marmalade whose thick, syrupy texture added decadence to the dish, while the acidity of the fruit harmonized with that of the cheese. The almonds added a nutty, oily element and additional sweetness, as well as a textural contrast (crunch). The Salty Pig may well become one of my new favorite low-key hangout spots. 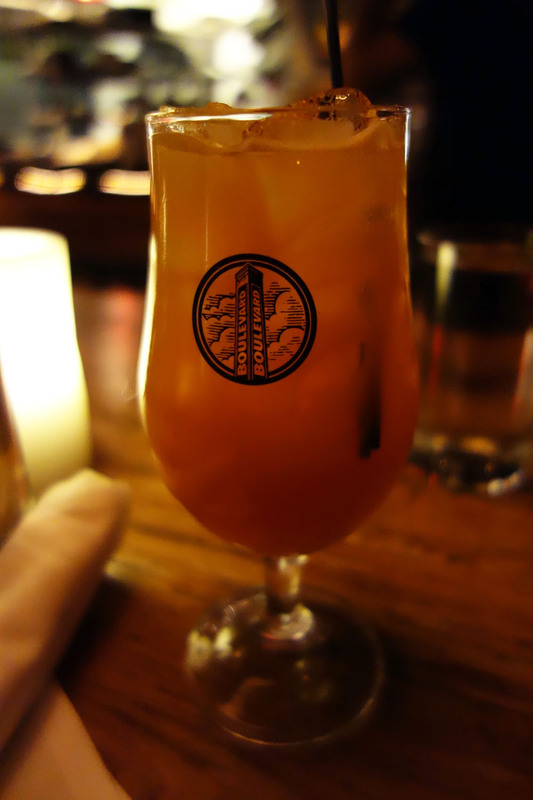 It is relatively close to my apartment, their cocktails are inventive and the menu options are perfect for a nibbler such as myself. February 3, 2013 in BOSTON. great foodie blog I just discovered!